Welcome to MyDogsDigIt.com, a product review, dog blog, and training how-to site. 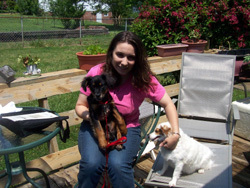 Christin McDowell, dog trainer to the public and owner/trainer of her own pack of pups, has a deep interest in informing pet owners about products available to meet their specific needs. She has found through her extensive interaction with the public that many people are unaware of products available to them that may help with specific needs such as separation anxiety, urinary incontinence, allergies, high-drive dogs, or destructive dogs–just to name a few. Through her own personal experience with “special needs” animals and animals with behavioral problems, Christin has explored many available products and found that there was a lack of thoughtful and detailed product information. Christin believes deeply in the bond between a person and his/her dog(s) and the benefits of companionship that this relationship can provide. She believes that training is a tool that one can use to learn to communicate with their dog and that when this line of communication is opened there can be very special results! Christin bases her training methods on positive reinforcement along with the recognition of specific behavioral problems and issues and works hard to design a training program best suited to each individual situation, incorporating basic obedience, exercise and problem recognition. If you live in the Charlotte North Carolina area and are interested in training your puppy or dog with Christin, please click the “Email Me” button at the top of the page and send and inquiry. Christin will provide a consultation free of charge and can work with you to develop a training program to meet your specific needs. References available upon request.